I'm not actually a huge fan of rocky road or the similar chocolate fridge cake. Mainly because a) I don't really like marshmallows so that rules out rocky road and b) I don't like raisins/currants and most people put those in chocolate fridge cake. The answer would be to make it myself and omit the marshmallow and raisins but for some reason it has never occurred to me to do that! Anyway, anyway, anyway I was looking through Mammasaurus' blog and I saw some Rocky Road that looked so delicious I just had to make it. Luckily I was going to visit my cousins so it was the perfect treat to take them (well it would have been if I hadn't eaten most it before I got there!). I didn't have most of the ingredients from Mammasaurus' blog so I looked through some old cookbooks to find a suitable 'base' recipe that I could alter (mainly take out the marshmallows and raisins!). Anyway I found a recipe in the Good Housekeeping recipe which I adapted a bit, which is below. I haven't told you the best bit about my rocky road though. I've said that I don't like marshmallows and I wasn't lying but what I didn't tell you was that I do like melted marshmallows. In particular gooey roasted marshmallows on a stick over the fire. I wanted to get those type of marshmallows in my Rocky Road and I did with a little of help of "Fluff". For those of you that don't know, Fluff is marshmallow spread that has been brought over from America. It's marshmallow that is permanently melted. IT IS HEAVEN IN A JAR. It was so hard not to eat it straight from the jar but I held off long enough to get some in the Rocky Road's. You can buy it from most supermarkets and it's not too expensive (for a little spoonful of heaven no less!). Anyway, anyway, here is the recipe, you should have most of the ingredients in your house already and it is a great recipe to do with the kids. I forgot to take pictures as I went along but I did make one of those instagram movie things (a really bad one mind), which you can watch at the bottom. It' very informative (it's not). ps. I dare you to only be able to have one - it's really not possible! 1. Place the chocolate, golden syrup and butter in a bowl over some boiling water. Make sure the bowl does not touch the water. 2. Heat until the chocolate and butter has melted. 4. Add the digestive biscuits to the melted chocolate mixture and stir until incorporated. 5. Pour into a lined baking tray (roughly 20x30 but whatever you've got) and push into the corners. 6. Dollop on around 3 tablespoons of fluff over the top and stir in roughly. 7. Place in the fridge for 30 minutes. 8. Melt the remaining chocolate in a bowl over some water. 9. 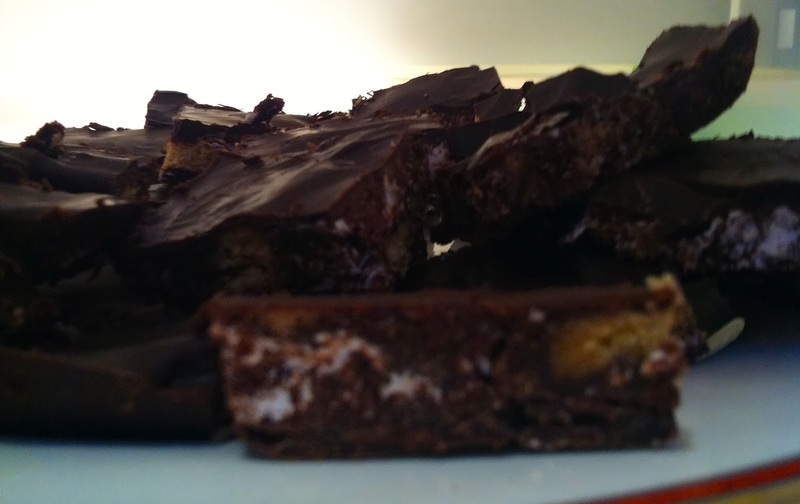 Once the rocky road has chilled for 30 minutes spread the melted chocolate thinly over the top. 10. Chill for at least 30 more minutes, cut up in small pieces and eat to your hearts content. Here's the video: Instagram Why don't you follow me on Instagram too (katieshuster)?